Harvesting and saving rainwater is an amazing free resource we can benefit from and utilise in many different ways. Catching the rain ensures that all those litres of free water are not wasted by running down the drain. Instead, they can be beneficial in a number of ways around your home, as well as help to reduce your environmental footprint and lower your utility costs by not having to use town water supplies. Are you aware of the fact that in Australia 50% of the annual average water consumption is used for watering gardens or flushing the toilet. That is approximately a whopping 275,000 litres yearly per household literally going down the drain! 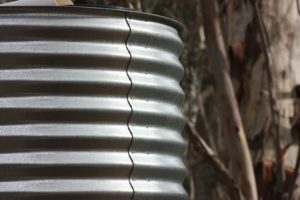 So, by having a rainwater tank on your property you can potentially save millions of litres of water each year as well as have some extra dollars in the bank to spend on other things. Rainwater tanks are multipurpose. You can use them outside – to water the garden, for washing cars and refilling your pool/ spa. You can also use them inside, by linking rainwater to your home toilets, hot water supply and laundry. To maximize the benefits of your extra (free) water, we recommend using it for both, however this just depends on the size of tank you choose to install, and the size of your land. Now you are wanting to install a tank to store all the rainwater that you collect but are not sure what type will suit your needs best. Here we outline some key differences you need to know in order to help make your decision less confusing. Deciding on what you would like to use your tank water for is the first factor to consider. For example, is it for outdoor use on the gardens, or is it for household use in toilets and washing machine, or maybe you want it for both areas or for use in other ways? For household use, some areas have council restrictions to toilet and washing machine use only, whereas in other areas you can use your tank water for the whole house. If using for the whole house you will need to take into consideration how big the household is. Obviously, a family of 6 people will utilise more water than a household of only 2 people. A rough guideline to go by is the average person will use 150 litres of water per day. How big is the catchment area on your property? There is no point installing a small water tank at a big house. The catchment area will obviously be larger than what a small tank could hold and you will loose precious rain water that you could be using. There are 4 main materials which water tanks generally come in and they are polyethylene, fibreglass, concrete and metal. This material is strong, lightweight, cost effective and long lasting. Poly rainwater tanks come in many shapes, sizes and colours and are, of course, not subject to any rusting. They are constructed in one whole piece which means that there are no seams to cause weak points. A poly tank is suitable for the Australian environment as they can withstand harsh climate conditions, and they can be installed both above or below the ground. Fibreglass tanks are corrosion resistant, are available in various sizes and can be fitted above or below the ground. This material will allow more light penetration than others which may result in more algae growth. It is brittle which can lead to cracks, and fibreglass also requires a UV-resistant coating to prolong the life of the tank. These tanks are more expensive than poly tanks. Tanks made from concrete are perfect for the Australian Climate as they have excellent insulating properties keeping water cooler. 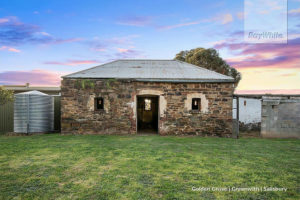 They are bushfire proof, rust resistant with little chance of corrosion, are long lasting and are extremely strong due to reinforced steel in the concrete. Concrete tanks are available in different sizes and are mainly used for underground installation, although above round options are still available. They are however more expensive to build and are not able to be moved once installed and in position. Metal tanks can initially be the least expensive option but some (depending on which metal used) can have a shorter lifespan than other options due to its corrosive nature. There are a variety of metals available such as stainless steel, galvanised steel or zincalume. Metal tanks are UV resistant, come in various sizes and can be either corrugated or a flat rolled finish. 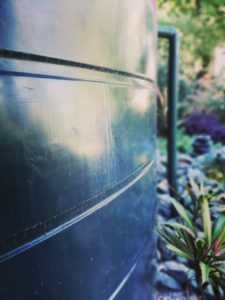 Purchasing a rain water tank is a big investment so understanding the different options is important. Contacting your local council and water supplier will ensure you are aware of any rules and regulations that may need to be followed in your area. If you would like some information on updating the outside of your home take a look at our blog on rendering your house. For assistance with any residential or commercial design or decorating projects please contact the team of Inspired Spaces today!